Installing the Gigabyte Brix drivers. 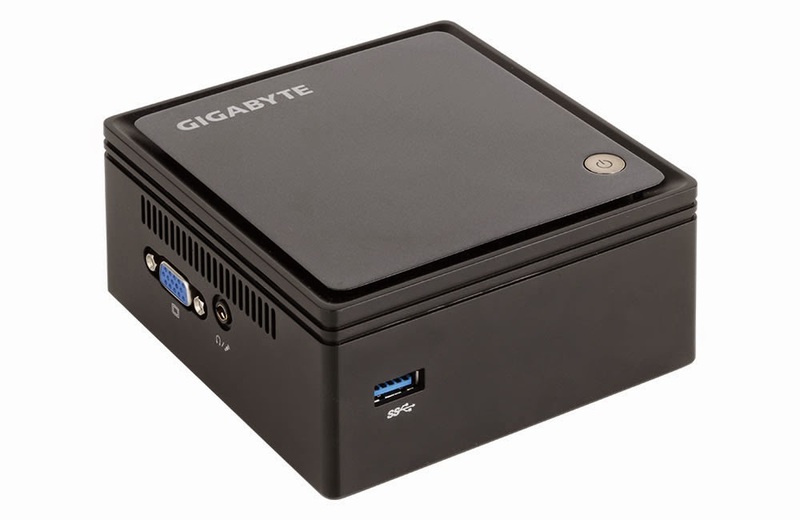 1 x Gigabyte Brix - GB-BXBT-2807, AUD $165. Purchased here. 1 x 2.5" SSD Intel 520 series, 120GB, AUD $79. Purchased here. 1 x 4GB memory - SO-DIMM DDR3 1.35V 1600MHz (GEIL) green series, AUD $59. Purchased here. 1 x Windows 7 (64 bit) DVD (or ISO file). Purchased from : PLE Computers, Bentley, WA, Australia. 1 x USB hard drive with at least 4GB free (I used an old USB 2.0, powered, 250GB 3.5" Western Digital hard drive), but you can just as easily use a small USB flash drive or a portable 2.5" USB drive. 1 x small Philips head screwdriver. 1 x desktop PC or laptop running Windows; for setting up the Windows 7 USB boot drive and copying some Brix driver files. 1 x monitor, either HDMI or VGA. 1 x wired USB Keyboard. 1 x wired USB Mouse. Take off the bottom panel by unscrewing the 4 black screws. Inside the unit, remove the tape holding down the SATA cable. Install the low power (1.3V) RAM into the single slot - need to insert it at an angle fist, then push it downwards until it clicks into place. From the bottom panel, remove the 2.5" HD cage (mine had two screws, but its meant to have 4) and install the 2.5" SSD into the cage. Connect the SATA cable to the hard disk. There's only one way it can be inserted, so you can't make a mistake. Screw the cage back onto the bottom panel. Replace the bottom panel onto the Brix. Connect the power supply to the DC-in port. Connect a monitor to either the HDMI or VGA port. Connect a wired USB keyboard to the USB 2.0 port. Turn on the Brix via the power button on the top. Keep pressing the Delete (DEL) key on the keyboard about twice per second until the BIOS screen appears. Use Left/Right arrows to navigate between tabs. Confirm that the RAM and SSD have been detected by the BIOS. Change the operating system option to Windows 7. Note that the Brix requires the Windows 7 64-bit installer. Switch off the Brix via the power button on the top. Ensure you have a Windows 7 (64 bit) install disk ISO file. If you have only the DVD, as I did, you will need to rip it to an ISO file at this point, using the ImgBurn software for example. Leave the ISO filename the same as the disk label (default behaviour). N.B. ImgBurn has a notoriously sneaky installer that will install "conduit" search malware and other crapware if you don't read the installer options properly, and deselect all options apart from the first one, which is ImgBurn itself. Download and run Rufus - a utility to help you create a USB boot drive from an ISO. Rufus is a standalone .exe file, no install is needed, which is awesome. Connect to the laptop a USB drive with at least 4GB free space that will be formatted (erased). If no drives appear at this point, its because Rufus defaults to only displaying USB flash drives. Press Alt-F to have it display all fixed USB drives. In Rufus, select the target USB drive and also the source Windows 7 ISO file. Select the option "create MBR for BIOS and UEFI computers" and also the NTFS file system. These should be the defaults after selecting the Windows 7 ISO. Create the USB boot disk in Rufus. Leave the disk label the same as the original ISO (or DVD). After Rufus has finished, disconnect the USB boot drive. Connect the USB boot drive to a USB 2.0 port on the brix. Keep pressing the DEL key on the keyboard about twice a second until the BIOS screen appears. In the BIOS boot menu, confirm the USB boot drive is detected. If it is not detected, you may need to boot one more time by powering the brix off then on. I think this is something to do with the USB boot drive not being ready for the BIOS, which boots very quickly. In the BIOS boot menu, press the '+' key to move the USB boot drive to the top position. Go through the Windows 7 setup. You can do this just fine with only a keyboard and no mouse, using TAB, SHIFT-TAB, UP, DOWN, LEFT, RIGHT and ENTER to make selections as required. After the Windows 7 installer has finished copying files and is starting the installation it will prompt you to restart the Brix. At this point, you should go into the BIOS and restore the boot setting to boot from the SSD first (not the USB boot drive). Alternatively, you can just turn off the USB boot drive at this point, before the restart occurs. Connect a wired USB mouse to the USB 2.0 port vacated by the USB boot drive. Some commenters below have reported getting an error when trying to install Windows 8 at this point. The message from Windows is something like "windows could not update the computer's boot configuration". As suggested by commenter Tim Bailey, the solution is to update the BIOS to the latest version. You can download the BIOS update tool from the Gigabyte website. For DOS, please type flash.bat in the dos mode. For Windows, please select folder and type f.bat in the windows command prompt (cmd.exe). After Windows has been installed and booted ok on the Brix, install the following drivers from the driver CD by copying everything on it to a USB thumbdrive on your laptop and then inserting into the blue USB 3.0 port on the side of the Brix. WiFi+BT driver - just double click setup.exe to install. This gets WiFi and Bluetooth up and running - you can then connect to the Internet. Requires a reboot after install. Graphics - just double click setup.exe to install. Requires a reboot after install. USB3 - just double click setup.exe to install. Requires a reboot after install. Audio - just double click setup.exe to install. Requires a reboot after install. Chipset - just double click setup.exe to install. Requires a reboot after install. A comment by a reader in the comments section below (Warren Rushby, December 10, 2014) indicates that this step was vital for his i3 model, so installing this driver is recommended. I personally didn't bother installing the other drivers as they either weren't required by me (e.g. LAN) or they seemed to be only for Windows 8 anyway. To be on the safe side, especially if you are having issues, its recommended installing all the drivers. My boot time is 17 seconds from power on to the Windows 7 login screen. Not too bad, helped no doubt primarily by the SSD. In Windows, replace the wired USB mouse with a wireless USB mouse and wait for Windows to install the driver (takes a minute or two). Replace the wired USB keyboard with a wireless USB keyboard and wait for Windows to install the driver (takes a minute or two). I noticed a couple of times that the wireless mouse wasn't working. I had to unplug and replug its USB dongle, and that fixed it. At this point I installed this software, which I personally find are essential in Windows, although you might have differing opinions on each category. All are free. Browser: Run Internet Explorer to download and install Firefox. Then I remove the Internet Explorer links on the task bar and desktop. Anti-virus: Microsoft Security Essentials. Nothing fancy but gets the job done. Flash: Adobe Flash Player. Be sure to deselect the McAfee A/V installer option. I really hate installing Adobe software onto a new PC. My only reason for doing it is for the many websites that still rely on flash. Media player: VLC Media Player. Then I remove the Windows Media player link on the task bar. Editor: Notepad++. An excellent replacement for Notepad which supports probably every known programming language, including Golang. Small snippet of trivia to finish with ... the Gigabyte Brix was named after Colin Brix, who is a marketing director at Gigabyte's Motherboard Business Unit. out of curiosity, what are you using your brix for? I'm using it as a PC, connected to a big screen TV ... its pretty capable for doing basic things like browsing, watching movies online, etc. It doesn't get hot, has low power consumption and is very quiet. Lubuntu and xbmc, if you are using ethernet, just make sure you disconnect the wireless, and turn the volume up from lubuntu as well as xbmc. Works great. Hi I just got the Brix yesterday. I installed a Kingston 4GB 204-Pin DDR3 SO-DIMM DDR3 1333 Laptop Memory and Western Digital Blue 2.5 Inch 500GB 5400 RPM Notebook Drive WD5000LPVX 8MB Cache SATA 6.0Gb/s. But I could progress any further because I can't get a connection to the monitor through HDMI nor DVI. I checked with a flatscreen and same result. Do you know of any resource that could point me to the right direction? Thanks. Maybe confirm first that the monitor is working on another PC? I think during boot it will output low resolution at something like 640x480 pixels so you should get something coming out at least. Alternatively, have you got a TV that takes HDMI input or an old VGA computer monitor? If so, then you could try that as well. I would like to know how you got on as I now seem to have exactly the same problem. Wrong RAM. I took my ram back and replaced it with the low voltage version (DDR3 1.35V), it worked straight away. Good Luck. I think I'm going to have to try new RAM also. My RAM appears to be dual voltage (or at least I think it is). It says 1.35V on the stick, but it's listed as 1.35/1.5V elsewhere. I wonder if it's causing chaos with the board. This is very useful article. Its seams that I also have the same problem with RAM and a wrong voltage. I also had the same problem but it was the correct ram .. it just wasn't seated correctly. Took the ram back out and reinstall. It then booted up fine. Before that, it would do nothing when you press the power button .. just sits there with black screen. I'm on step 1 ,#9 BIOS screen flashes but does not stay on when pressing del. I cannot set the bios for win 7. this message follows "Reboot and Select proper Boot device or Insert Boot Media in selected Boot Device and press a key." Is there any way you can test that your keyboard's DEL key is working ... do you have another PC you can try it on? Just to be clear, this is the 'Delete' key and *not* the 'Backspace' key. Good luck. Following a suggestion from their tech support I took the backup battery out for 5 minutes, put it back in, and the del option started working. You suggestion about not installing the chipset drivers is wrong. I recently bought an i3 Brix and skipping the installation of the chipset drivers caused me some headaches. After I had installed the Intel HD graphics drivers for the IGP and rebooted the screen would go black at the Windows logon screen. After countless hours trying different drivers, fresh installations and cables I installed the chipset drivers and the issue was fixed. So for me the chipset drivers were utterly essential. Hi Warren, thanks very much for your comment. I have updated the article to include installing the chipset drivers, and to say they are vital for some models. When I go to install windows 8.1, it goes into the setup, copies files, but then setup gives me an error "windows could not update the computer's boot configuration". I cannot continue from there and have to restart, which gives me the same error. Any ideas? Try updating the BIOS from Gigabyte's web site. I had the same issue, but flashing BIOS worked. Many thanks Tim, I have updated step 3 in the post with instructions to update the BIOS to the latest version (for Windows 8 users). Updating the BIOS to F5 didn't get me past this screen. Updating the BIOS to F7 still hasn't gotten me past the "windows could not update the computer's boot configuration". Secure Boot is off, Fast Boot is off. It's set to 8.x Mode, I can't install 32bit windows at all, and 64bit win8 and 8.1 still won't get past that screen. Hello, I get the same error message "windows could not update the computer's boot configuration", so I would like to try BIOS update. But how can I do it since I don't have OS (Windows 8.1) on my PC/disk? I have a Samsung EVO 120GB SSD which is failing to be recognised by the Brix BIOS about 80% of the time. I'm running Windows 7 and although I can get the PC to boot into Windows about 20% of the time, it's pretty critical that it is able to boot EVERY time!!! I have removed the SSD and checked ALL the connections inside the Brix and they are secure and fine - the fact that it boots 20% of the time indicates that something is working out! Upon testing this some more (albeit with only about 20 attempts - there are only so many times I can sit here and power this thing on! ), it appears that this is only happening when I RESTART the PC! In other words, if I use the Shutdown command in Windows and then manually power the Brix on with the power button on the top, it always boots successfully! It is only when I use the RESTART command in Windows that this is happening - the caveat being that I've only tested this about 20 times! Any thoughts on why this might be!!!! Hi NJW, sounds like a real doozy of a problem you have there! The only things I can suggest is to update the Gigabyte BIOS ... as detailed under step 3. Then if that doesn't work you can install the Chipset drivers as per step 4. Some other users say that these two items are essential if you're having BIOS issues. Posts on there might provide some more suggestions. Version F7 - 4.15 MB - which one is the one that I want to use? Thanks for the quick reply? I should also point out that I really don't know how to update the BIOS (I'm basically a Mac user!) and so some pointers with this would also be really great!!! Thanks! No worries! I think you want the F7 one. I believe to update the BIOS, you need to open a Windows command prompt on your Brix. Just type cmd.exe into the "Search Programs and Files" box or run it directly. Then follow the instructions on the Gigabyte site ... it probably involves changing your directory or something as well. I am hitting this bug as well (probably a BIOS BUG). Mine is a GB-BXBT-1900, and I've alread updated to BIOS F6 released on 2015/02/17. In a few words, at the first boot, SSD (Corsair) doesn't get detected, and an EFI shell is dropped in my case (I don't have any other device connected). If you hit a simple ctrl+alt+canc, then the system will boot fine, since the disk looks like it get detected. This tricked me also on the first install of Ubuntu, when booting from USB goes fine, but no disk detected, until the next reboot. I've also problem with wifi drivers with the latest ubuntu kernel (3.19), I think I am going to return it immediately and then try more luck with Intel NUC. I hope you have time to take a quick look at this, I just got my Brix today, installed hard drive and 4GB 1.35v RAM. I created a bootable flash drive on another computer, with W7 Home Premium on it, put it into USB 2.0 port on Brix, connected the Brix up to a monitor, it sees the 'Sandisk Cruz...' flash drive and the Hitachi hard drive in the BIOS, I put the flash drive as first boot option, on restart it just sits with flashing cursor and absolutely nothing happens(sad face goes here). I tried the flash drive in another computer, works fine, loads Windows files and proceeds with installation (which I then abort). Any thoughts? Thye Boot Config has 'UEFI: Built-in EFI...' whatever that is. Well done - the BIOS boot options can be really tricky, sometimes it takes a few attempts to understand the menus options fully. Got my Gb-BXBT N2807 today. Installed Crucial 4GB and 120GB ssd. Connected HDMI monitor (and then tried a TV) keyboard. Powered on - nothing. Power off/on, hit Del furiously - nothing. Tried a VGA. Nothing. Hi, looked to this page for help as I also have no output from VGA at boot...any help appreciated. I saw an earlier suggestion to remove the backup battery for while which I did. See no video output. It is difficult to decide if the unit is DOA. I submitted a tech support ticket to Gigabyte and wait to see if I get a reply. Hi Dave, as I replied above to Perry, my advice is to return it to the retailer you bought it from and ask for a replacement due to it being DOA (dead on arrival). "Wrong RAM. I took my ram back and replaced it with the low voltage version (DDR3 1.35V), it worked straight away. Good Luck." Great guide!! I have just got one and this helps a lot!!! I have a strange one. I am running Arch Linux. The machine runs perfectly. I can reboot it remotely and it comes back up. 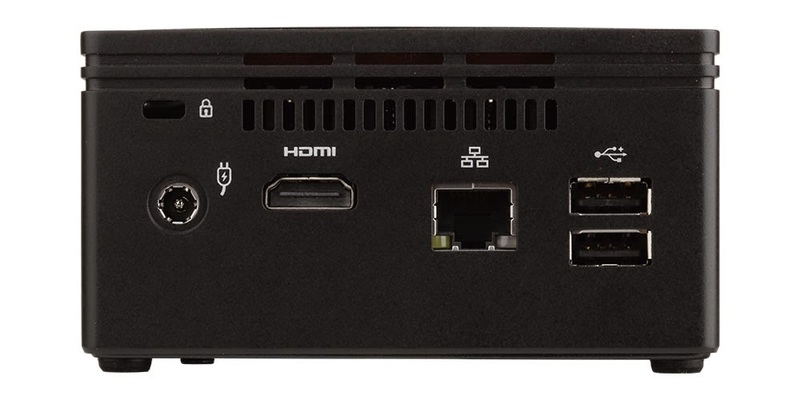 If I remove the HDMI cable (either end, from the TV or the Brix), the machine won't come back up on a boot. If I plug the HDMI cable back in, even with the TV off, the Brix boots perfectly (just by pressing the power button, even without seeing anything on the TV). I can't find any settings in the BIOS which apply to requiring a monitor being connected. I am reasonably sure I can pull the HDMI cable out once the box is on, but if it was rebooted after that, I'm also reasonably sure it won't come back up. Same issue here - except with VGA. If the monitor is plugged in then it boots, without it, it never gets anywhere. I'm running Ubuntu on it, but I'm not convinced that's the issue. The fix here solved it for me. Anyone knows a way to put the somputer to sleep and be able the wake up after 7-8 hours of sleep? Thanks. I have a mad question :-)... May I use Mini PCI-Express Slot for Half Size mSATA Hard Drive instead Wi-Fi + Bluetooth Card ? hey there everyone, i just purchased the i3 version, and when i go to set it up, my keyboard lights up(mechanical gaming keyboard) and then turns off. Im not able to access the BIOS. I have the correct type of ram but the store i purchased it from didnt inform me of having to use a msata ssd. would not having the ssd cause it not to work? Ive tried 3 keyboards along with 3 monitors using the MD port and the hdmi port. Thanks! 1) Install latest BIOS (mine is F7). 2) Under BIOS > Advance > CSM: Turn CSM off in order to install Windows 8.1 from a flash drive. @ Hain, John, I had the same problem and it turned out to be the RAM I installed was 1.5V. It HAS to be 1.35V or it will not POST. Hello there, greetings from England. Do you have an issue with Brix powering itself up on its own? Example, switching it at night to find it turned on in the morning? BTW the brix which i posses is a Gigabyte Brix BXBT-1900 powered by win7 ultimate 64 bits. Any idea what could cause it? Thank you in advance. You haven't got the Wake-on-LAN feature turned on have you? Hi, I have just purchased a Gigabyte Brix GB-BXBT 1900 all setup ready to with Win7, when I first turned on I installed Core Temp to keep an eye on how hot it gets, which I do with all my computers, after a few minutes the temp got to almost 60 degres on all 4 cores, my question is how hot should these run? Yours is a newer model I think so it will be at least the same. That being said I think you normally try to keep the temp as low and stable as possible. thanks for quick response, that puts my mind at ease, I am always a bit concerned when cpu temps go above about 35 degrees..
Hi, I installed my Windows 10 Brix yesterday but I'm seeing terrible lag when viewing videos at 1080p. Installed all the drivers, chipset etc. Is this normal or are these machines expected to be able to handle streaming videos in 1080p? Its not net lag, definitely hardware before anyone suggests! Thanks for your reply - mine is the Gigabyte Brix BXBT-2807 Ultra Compact PC Kit. I'm streaming from WWE Network and Netflix. Both are unwatchable at even 720p. I haven't installed any codecs, VLC or anything, not sure if that'll make a difference. The whole thing just feels underpowered for 1080p videos. No worries, yes its exactly the same model I have - I agree it feels underpowered when streaming video online - I never got to the bottom of it either. For me at least it seemed to make a difference when plugged in to the net via an ethernet cable, there was some reduction in lag, possibly due to uploading being faster on a cable. Also in my house theres about 3-4 people on the net all the time and our connection is pretty crap - running at about 4mbps. I still have Windows 7 on mine - haven't upgraded to Win 10 yet. As an FYI, it appears that this unit is very picky about memory. I bought a Kingston 8GB 1.35/1.5V stick that *should* be compatible, but like others have said, it doesn't POST. I just ordered a Corsair 8GB stick that's listed as being compatible by Gigabyte (and several folks on Newegg have said it works), and hoping it'll work. The one I'm looking at is CMSO8GX3M1C1333C9. Hope it works! Hi, brixlovers! I ow one 10 days and still can not make work it properly. First, my RAM is only 2G (otherweis is as specified). I have downloaded iso MS W7 64bit from MS official site. Created bootable flash with W7 command line and then used ms download tool to create w7 bootflash. Made all changes in bios: w7, first boot device, hdd as second. This hdd is not virgin and system always finde there something to start with and procide with flash. But as soon as it switched off to disabled no boot process, just shell command line. Finally I have running system - but with no full graffic facilities (configuration does not allow...) and may be with downshifted facilities. Thank you for advice. Hi Nikolay, how did you get on with your problem? sorry I don't have any useful suggestions for you on this. Best of luck. Hi DC, finally i hired a guy, who brought a good dozen of sticks with drivers. After 3 hours of work he made all the devices run properly. But he had to exchange wifi card. The new one has no bluetoth and loos the connection sometimes. This prof even did not use original drivers. 100 bucks and that was it. Buy the way I still use W7 32 bit. Sometimes the system claims a lack of memory. Hi, could somebody give me a sugestion here. I got one of these Brix 2807 second hand, instaled win 7 on it and it went fine. Flash the bios through win 7 to be able to install windows 10, but now I have no video output. No hdmi, no vga, nothing. The Brix will turn on, I can hear the hdd moving, the ethernet led blinks, but no video output! HELP! Any update to this? I tried updating the BIOS to version F8 and now get no display output. ARRRGH - Flashed my GB-BXBT-2807 to F7 now just a blank screen HELP!! Hi Mark, sorry to hear that! is it possible you can return it under warranty to the place you bought it? did you buy online or in a store? Ah sorted it all out now - Maplins replaced it quibble free - with the later image already on. Banged on WIN 10 and it works most satisfactorily. Now all I have to do is get my money back from Coastal Software for selling me a very dodgy Win 7 download - Thanks DC. Keyboard (KB) and Mouse (M) Problem: I read that WIRED KB & M were required initially only. As I did not have WIRED KB & M, I used my WIRELESS KB & M successfully all the way to install Windows 7 and install the Chipset, Graphics, and Audio Drivers (copied from BRIX Pro Drivers disc). Everything was great. BUT, after I installed the USB3 Drivers, my WIRELESS KB & M will not work! Can anyone suggest a fix? Do I need to get a WIRED KB & M at this stage? Please help. I have the Gigabyte BRIX Model GB-BXi5-4570R, with a 250GB mSATA SSD, and 16GB of RAM. I want to use this computer to replace my existing HTPC computer which has a very slow Atom processor. I like what I have seen so far, so I might even buy another BRIX to replace my large desktop computer. Problem Partially Fixed: I discovered that my WIRELESS KB & M worked when I started Win7 on my BRIX Mini-PC in "SAFE MODE". While in "SAFE MODE, I restored an earlier System Restore Point, which removed a few Drivers, including the "Intel USB 3.0 eXtensible Host Controller Driver ...". After that, my KB & M worked properly with Win7 Normal Startup. I guess that my 4 USB ports in the BRIX were changed back to USB 2.0. BUT, can anyone advise why my WIRELESS KB & M would stop working when I installed the USB 3.0 Driver? I thought USB 3.0 should work with USB 2.0 devices. If I need USB 3.0 ports in the future, do I need to upgrade to a "USB 3.0" WIRELESS KB & M? I have problem when installing Windows 7 with my keyboard. In BIOS it works normally but when the Windows loading screen starts, keyboard light shut off. I try all usb ports and still nothing. I'm trying to get Win7 onto a Brix (GB-BACE-3150) it got upgraded to 8gb RAM and 1tb hard drive before going in the mail. The RAM appears in the BIOS with no issue but the hard drive sometimes does and other times doesn't. Yet at the same time I can put in my Win7 installer USB stick and it appears there, lets me create/delete partitions and format the drive, but won't let me install Windows. I've tried setting the BIOS to UEFI with CSM enabled and disabled, and setting it to Legacy as the Gigabyte book suggests, but no luck. Is this a hard drive or a BIOS issue? it was a hard drive issue alright. funny how they don't work when the ribbon isn't plugged-in to the mboard correctly! Excellent - good to hear you fixed your problem! Hi & Help, I know i'm cutting it close but got brix 2807 and had the win 7 update issue not updating got it sorted, now installed win 10 and got to 1st reboot then 23% when it rebooted again and stopped on the windows symble. Now I've tryied swapping bios to win 8 but that didn't work so went and got f8 bios but i can't get it to install using the program supplied, I'm on f4 bios right now. Any idea's or stick to win 7 on here. Hi, I am having issues with my brix not recognising and LAN and therefore i can't connect it to anything. Hi all. I just wanted to put in my experience with the "windows could not update the computer's boot configuration". I was trying to install Windows 7 x64 and got that error. After hours of tinkering, I got it to work using BIOS version F8 by changing the operating system in the BIOS to "Windows 8.X". It installed without the error and then failed to boot after first restart. I then change the BIOS setting back to "Windows 7" and the installation finished successfully! As ridiculous as this sounds, it works! Hope this helps someone!